for large paper sizes such as 12 “X 18”, 11 “X 17” ( A3, A3 super ), etc. As a consequence of this, the market has a need for business cards slitters with a large paper size. Increasing the paper size and increasing the cutting speed significantly increases productivity and reducing the cost of labour.To cover the market demand for large-sized cuts simultaneously with the increase in cutting speed, our company began to produce this type of slitter. This professional Business Card Slitter is used to cut 20 full color business cards with gutters 1/8″-0.125 ( gap 1/4″-0.25 available) between each of the cards and accommodates tw0 different stock sizes: 11″x 17″, 12″ x 18″ with minimum time for a change of stock. The principle of business card slitter ERSO 2006 FB operation. 20UP Full Bleed (gutter cutter)Automatic Electric Business Card Slitter- model 2006FB. This model accommodates 12” x 18” and 11″ x 17″ stock and creates finished product in 2 passes. Cut 12” x 18” or 11″ x 17″ sheets into four strips of 3.5” x 12 “ (3.5″ x 11″) on the first pass with gutter 0.125 (1/8) between Business cards and finished the job by taking the 5 up sheets and cutting down to 2” x 3.5” cards with gutter 0.125 (1/8) between Business cards. Infeed stack allows keeping up to 60 pages #150 and cut with speed up to 500! Business Card per minute. Bleed falls in special bleed tray and you get clear product not mixed with bleed. For each slitter we enclose an arrangement of cards in sheet. 1) Perfect cuts and adjustable infeed to accommodate different types of material thickness and width. 2) Cutting blades are semi- self-sharpening to allow for many years of operation without sharpening or replacement. 3) Updated ( significantly ), reliable Urethane bottom friction feed , which catch any types of paper. 6) No curve cards. Clean cut. Slitter cuts any type and any thickness of paper (even carton), plastic, laminated product, double sheets( glued), UV coated e.t.c. 7) This slitter’s powerful motor allows you to cut hard card stock rapidly and precisely. 8) All bleed (margin cut off) drop on bleed tray and finally product is clean. Specifications of business card slitter. Speed up to 700 cards per min. Infeed Stock size – up to 70 sheets in one time. Life Time – no less than 10 years. Warranty: 1 Year for parts and labour. 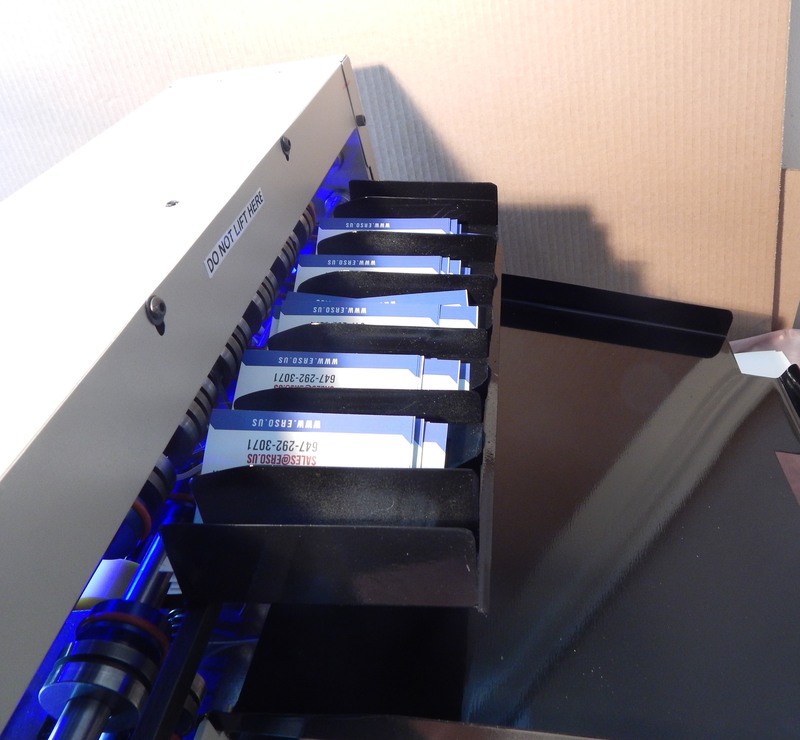 Video demonstration of business card slitter work. Our Company has a flexible price policy, which allows individual approach to each client, to each order. We accept Visa, Master Card and American Express credit card payments, PayPal payments, money orders and checks.